What "digital" means precisely tends to divide opinion in the charity sector, but if there’s just one thing on which there is almost universal agreement, it is that most charities still struggle with it. The latest Lloyds Bank UK Business Digital Index revealed that more than 100,000 charities lack basic digital skills, which is more than half of the registered charities in the UK. The report said that 9,000 charities don’t use the internet at all and one in three believes being online is irrelevant. There was also a four per centage point rise in the number of charities that rated their digital capabilities as low. It’s these revelations that led a group of organisations to join together and set up the first Charity Digital Code of Practice to develop charities’ digital skills, create a level playing field and improve the take-up and implementation of digital activity in charities by increasing the skills and confidence of staff. Forty-two per cent of autistic children experience anxiety, compared with 3 per cent of typically developing children. Anxiety can stop them from accessing education, employment and healthcare, so tackling the problem early can bring major benefits to autistic children. In 2016, Autistica funded King’s College London to carry out research into anxiety among autistic children. The college created a paper-based toolkit to help autistic children manage their anxiety. In 2017 the toolkit was tested with 22 autistic young people and their families. A two-year corporate partnership with Deutsche Bank turned the toolkit into an interactive digital product. The charity ran a survey on social media about app use and anxiety and had more than 500 responses, which then fed into building the prototype. Sixteen autistic adults participated in three rounds of prototype testing, resulting in the app Molehill Mountain. The app helps autistic people understand their anxiety by building their knowledge, confidence and skills to self-manage their symptoms. The user identifies their worries, captures them and then unlocks tips on how to cope. There are 14 check-ins: at each one the user can track their progress up Molehill Mountain and review their tips and diary entries through a personal dashboard. They can also share their progress with whomever they choose. James Cusack, director of science at Autistica, says it hopes the app empowers autistic people to "understand and manage their own anxiety so they can live the independent, fulfilling lives they deserve". In the charity sector, digital is often referred to in terms of fundraising or campaigning. But often it’s about streamlining processes, reaching the right people with the right tools, being more effective and efficient, reducing costs and saving money. Although most charities are lagging behind, some are already using digital technology to transform how they deliver their services. Change Grow Live, the health and social care charity, is using digital technology to improve outcomes for service users and reduce the time staff spend on admin tasks. The charity started its digital journey by looking at how technology could help them achieve their organisation goals. Kevin Crowley, executive director at CGL, says digital isn’t about cost-cutting or replacing existing services, but about improvement, efficiency and saving time. "Our staff simply want more time to see or talk to service users and less time filling out forms," he says. "To reduce barriers, we have set up an online self-assessment and referral portal, a mobile case-management system and Remote.Consult, a video-conferencing service." However, Crowley is keen to stress that digital is not a replacement for seeing a clinician in person. "It’s meant to complement the service," he says. "It’s also about offering greater choice." CGL is able to use technology to put the right professional in front of the right service user. It means specialist clinicians don’t need to travel around the country, which saves both time and money. "Having proved the concept, we’re going to scale it up and embed it into our offer for younger service users, who are more comfortable seeing a professional on a screen rather than face-to-face." James Plunkett, executive director of advice and advocacy at Citizens Advice, says that digital is not to be viewed as a cheaper replacement for face-to-face. "When we started our digital journey several years ago at Citizens Advice, our website was so poor that we had to focus our efforts there," he says. "Over time, this led to the misperception that digital refers to online advice and that investing in digital meant not investing in face-to-face services, or that it implied nothing more than ‘channel-shift’ away from face-to-face." It was only when Citizens Advice built its online case-management tool, Casebook, that it realised how untrue that actually was. "You don’t invest in digital as an alternative to face-to-face," says Plunkett. "You invest in digital to make all your services better, because ultimately it’s about people." Most people equate digital with technology, but digital is about more than just technology, says CGL’s Crowley: it’s about methodology, processes and people. "We know that, in order to implement and embed digital, we first need staff buy-in," he says. "And if we are to get their buy-in, they have to understand the purpose." For Citizens Advice, Plunkett says that although digital technologies are a powerful way to change a service, what really matters is the method by which change is carried out: user research, user-experience design, agile working, co-design, and solving problems in experimental ways. Invariably, it’s about putting people first. Crowley says that CGL’s approach to digital is to develop a proof of concept and then "pilot, test, iterate and, if successful, look to scale". The blood cancer charity Anthony Nolan is using a mobile phone app to help stem cell transplant patients take control of their recovery. The My Transplant Tracker app has been funded by the charity and is free to download. It lets patients set goals, track any aspect of their recovery, set up appointment reminders, access information and monitor their progress over time. It is password-protected, so all data is confidential and held only on the device. The charity decided to create the app after patients raised the issue of how difficult it was to manage their recovery. Anthony Nolan ran a focus group to determine patients’ needs and how these could be met through technology. Jonathan Kay, patient information writer and researcher at the charity, says the app is not only helping patients, but also reducing strain on the NHS, which could have huge benefits in the long term. "The tracker allows patients to manage their own recovery and to report any problems to their medical team sooner, which means they can get treated more quickly and effectively," he says. "There is a growing body of scientific research that shows patients who manage their own recovery have a better quality of life and live longer." Kay says the feedback from patients has been great and the charity is about to start a marketing campaign to promote greater awareness of the app among stem cell patients. But it is important to remember that digital alone doesn’t solve your problems. Digital is merely a tool. For digital to work, it requires a deep understanding of your audience and their needs, and of how digital will meet those needs. The key to digital is people. Accessing clean water in some parts of Africa is both difficult and expensive. 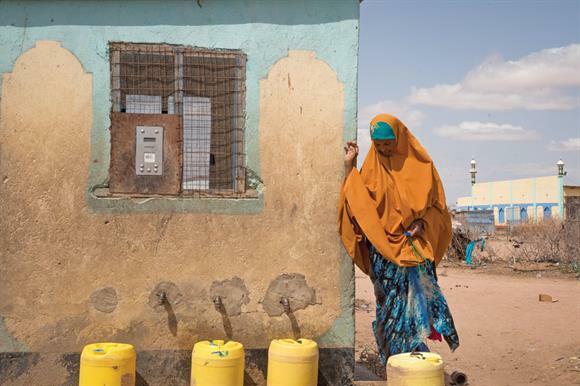 Oxfam and the social enterprise Maji Milele are piloting the installation of 31 water ATMS in a number of locations across two counties in arid and semi-arid parts of northern Kenya to help provide clean, affordable, accessible water. The water ATMs allow better management for both the water companies and their customers. People use smart cards that they top up through their M-Pesa mobile phone payment systems or in person at local resellers. They tap their cards on the machine to collect the water, which automatically gives 20 litres. They can simply tap off the card reader if they need less. Water is pre-paid, which helps the water companies understand and manage consumption and enables people to manage their budgets. There are no bills and people don’t need to take meter readings. Since installation, the water company Wajwasco has reported a 400 per cent increase in revenue collection. They charge customers a nominal, affordable fee, which covers supply and maintenance. The tap-on, tap-off system also means less wastage. Oxfam or the water company can give out free water to very vulnerable people via the smart cards as well as during emergencies. Joanna Trevor, Swift global programme manager at Oxfam, says there have been societal benefits too. "Girls are staying in school longer because they don’t spend so much time collecting water," she says. "As the ATMs are open 24/7, it gives women and girls more freedom." But the biggest benefit is that the water ATMs avoid the common problem of services stopping when charities move on or their funding runs out. For Oxfam, it’s all about providing sustainability.